Since coming back from Patagonia, I have been moving my office to a new location. And so that I would have enough to do, I also bought a new MacPro computer. Needless to say, I haven't been very productive in a photographic sense for the past few weeks, but now I am back in business (pretty much). I have begun editing my Patagonia pictures and have the picture count under 1000 after a first pass. I hope to have the best 10 or 20 images on my website sometime in June. 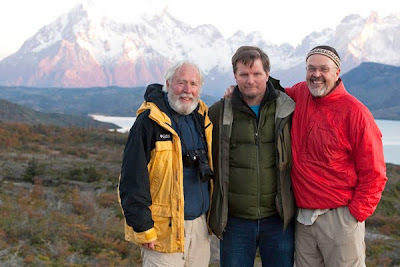 In the meantime, here is a picture of David Muench, Jack Dykinga and myself in Patagonia. It was an honor and privilege to be out shooting with these guys.